Anti-Morsi protest in Cairo, Egypt, August 2012. Photo credit: Gigi Ibrahim (via Flickr, Creative Commons license). The recent fall of Egypt’s democratically-elected civilian government is in line with the experiences of many other transitional states attempting to move from authoritarian to democratic rule. 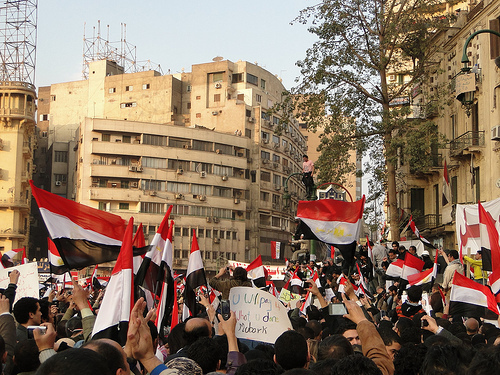 As with Egypt’s false start of 2012–2013, transitional states frequently revert back to authoritarian regimes. In the period between World Wars I and II, over half of the world’s democracies regressed to non-democratic forms of government. After a notable period of decolonization in the mid-twentieth century, the world experienced what Samuel Huntington referred to as another “reverse wave” of democratization in the 1960s. The latter wave of reversals was particularly notable in Africa. Likewise the “third wave of democratization” (from the mid-1970s to the mid-1990s) was followed by some notable setbacks, particularly in the post-Soviet region. The drive for political freedom in the Arab world—possibly including the emergence of liberal democracies—will likely be a generational struggle. The over-reach of the Muslim Brotherhood in Cairo, and a general lack of rule of law—in which the military, courts, and masses are all complicit—do not spell the end of democratic aspirations in this key Arab state. Humans beings, after all, do learn lessons and recast their behaviors and beliefs. In the wake of the Muslim Brotherhood’s contempt for political compromise and respect for the rule of law, Egyptians must grapple with what to do with a political party that has limited respect for democracy. The military’s ouster of Morsi was distasteful, at best. Perhaps it was the least bad path for Egypt’s future. Protesters in Cairo, Egypt, in February 2011, around the time of the fall of the Hosni Mubarak government. Photo credit: RamyRaoof (via Flickr, Creative Commons license). Earlier this week, the head of Egypt’s military warned that his country was on the brink of “state collapse.” General Abdul Fattah al-Sisi’s pronouncement followed on sustained, angry protests in Cairo, and violence in Port Said and other areas. Most analysts read the general’s assessment as a thinly veiled threat of additional military intervention in domestic politics, and perhaps a coup. Unfortunately, many prominent news outlets have accepted this phrase – “state collapse” – at face value. Two years after the overthrow of Hosni Mubarak, Egypt is facing disorder and great uncertainty in its political affairs. We should not confuse this reality with the much more dire circumstances of state collapse. For the sake of argument, we could even define “collapsed state” and “failed state” as synonymous. Even in this context, it is simply not appropriate to describe Egypt as a failed state. The people of Egypt and concerned outsiders should be very wary about accepting senior military leaders’ pronouncements at face value. Even though militaries can play the roles of public guardians, their record in democratization processes is spotty. Civilian control of the military is difficult to establish and sustain, but it is essential in the process of democratic development. Established democracies – such as the United States – must be vigilant in constraining the political ambitions of their soldiers, lest they replace the rule of law with the rule of the strong. On the whole, the country benefits from a strong sense of national identity. Rooted in common language, ancestry, religious background, and historical experience, Egypt is not a culturally divided state, despite small ethnic and religious minority groups, such as the Coptic Christians. 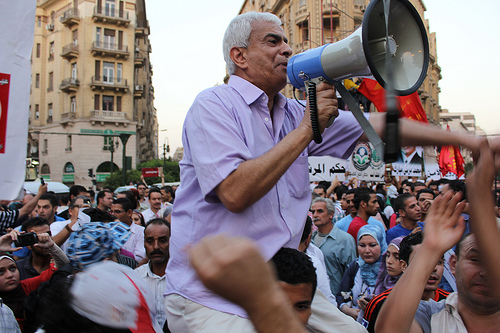 The large protests in Cairo and elsewhere are evidence of intense political engagement on the part of ordinary citizens. Instead of withdrawing from the state, citizens are seeking to reshape government and law. Despite serious strains and dysfunction, Egypt possesses a fairly large and internationally connected economy. Too many Egyptians face grinding poverty, but agriculture, industry, and tourism are all important sectors that provide livelihoods for many. The tendency of public figures and journalists to loosely use rhetoric is dangerous. Though scholars can descend into needless arguments about semantics, words must be chosen carefully, lest they lead to undesirable actions, such as military coups. War has returned to Israel and Palestine. At least every few years, Israel is involved in active, intense warfare on its northern or southern borders. And since Hamas gained control over the Gaza Strip in 2006, Israel’s southern flank has been particularly active. Now that anti-Israel elements in Gaza have acquired more sophisticated weaponry, and given wider political changes in the region, Israel’s precarious geopolitical situation has become even more perilous. 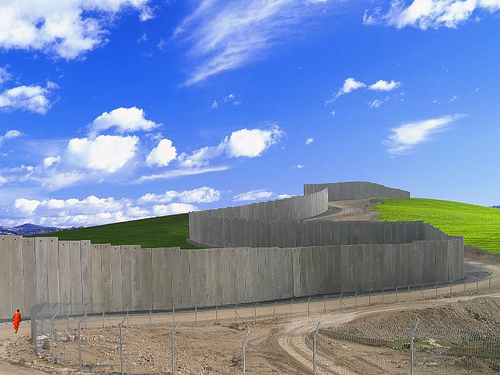 This is a section of the wall (“security barrier”) separating Israel and the West Bank (of the Jordan River). Photo credit: Ian Burt (Creative Commons license). 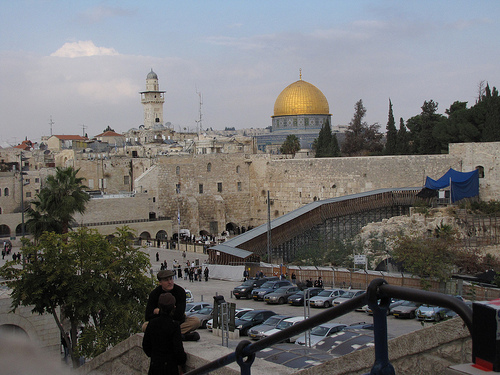 Given its out-sized importance in the Middle East, Israel is often perceived to be much larger than it is. Admittedly, the size of Israel depends on the definition of its boundaries, which are disputed. Any “fact” about Israel’s size is therefore dependent upon what boundaries are assumed (see, for example, this pro-Israel site). If the Gaza Strip, the Golan Heights, and the West Bank (roughly along the lines of the 1967 ceasefire) are excluded, Israel’s physical area is about 21,000 square kilometers (or 8,000 square miles). (The estimated population for this area is about 8 million.) That area is about one-third less than that of Belgium. Or, to use an American reference point, Israel is about the size of a smaller New England state (such as Vermont or New Hampshire). So what does Israel’s size have to do with the current war raging in and around the dense urban cluster that is Gaza? Simply put, Israel’s small size makes it exceedingly vulnerable to attack. That is nothing new. What is new is Gaza militants’ acquisition of longer-ranged rockets, which are capable of targeting Israel’s core population and economic centers, including Tel Aviv and Jerusalem. Iran seems to be a key link in Hamas’ acquisition of these rockets. Photo credit: acroll (Creative Commons license). One need not be pro-Israeli to recognize the increasingly precarious geopolitical context for the majority Jewish state. Whatever Israel’s past collective sins against the Arabs, the country now exists in a much more difficult regional situation, not least due to political upheaval in Egypt. Israelis persist in a heightened state of war readiness because they must. The United Nations cannot ensure Israel’s survival. Only hard-nosed realism can. On Monday, October 22, 2012, Mitt Romney and Barack Obama squared off in the last of three presidential election debates. The single theme of the last debate was foreign policy. Moderator Bob Schieffer (and the candidates) mostly debated U.S. foreign policy toward North Africa, the Middle East, and Af-Pak, or the core of the Islamic world. There was almost no discussion of Latin America, Europe, Sub-Saharan Africa, India, Southeast Asia, or Oceania. What a pity. The graphic below is suggestive of the places discussed in the debate. 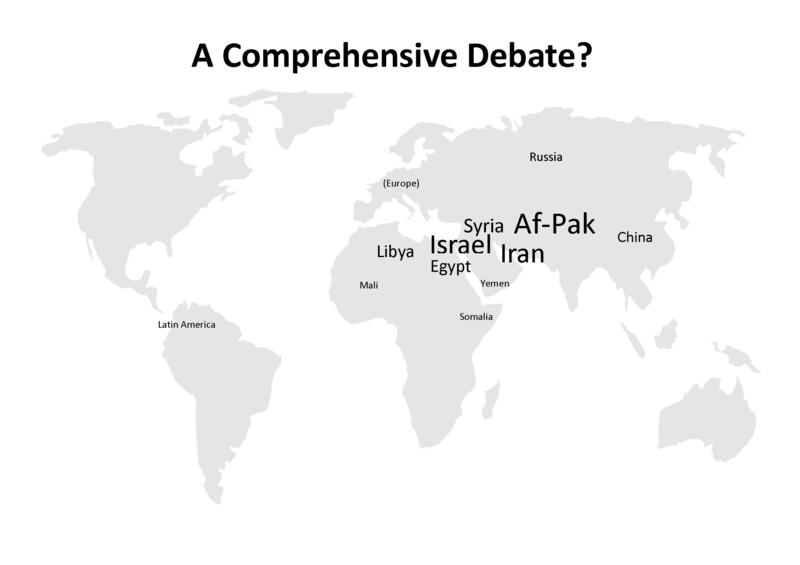 The size of the labels indicates the prominence of these countries and regions in the debate. On September 11, 2012 the United States Consulate in Benghazi, Libya was attacked by several dozen assailants armed with sophisticated weapons. The attack killed the U.S. Ambassador to Libya and several other diplomatic staff. On the surface the attack seems to be related to the release of an obscure online film, produced in the U.S. by clumsy critics of Islam. Related protests have occurred in Tunisia, Egypt, and Yemen. While the Libya attack may or may not be the start of a new season of heightened tensions between the United States and the Arab world, the attack does put a spotlight on state weakness in Libya. Today, many Americans are asking – indeed, I asked myself – how could this happen? How could this happen in a country we helped liberate, in a city we helped save from destruction? This question reflects just how complicated and, at times, how confounding the world can be. But we must be clear-eyed, even in our grief. This was an attack by a small and savage group – not the people or Government of Libya. Everywhere [Ambassador Chris Stevens] and his team went in Libya, in a country scarred by war and tyranny, they were hailed as friends and partners. And when the attack came yesterday, Libyans stood and fought to defend our post. Some were wounded. Libyans carried Chris’ body to the hospital, and they helped rescue and lead other Americans to safety. And last night, when I spoke with the President of Libya, he strongly condemned the violence and pledged every effort to protect our people and pursue those responsible. In short, how could a grateful Libya allow this attack to occur? For those who follow Libya closely, such as Paul Salem of the Carnegie Endowment for International Peace, the attack was shocking but not surprising. For more than a generation (1969-2011), Libya was governed through the highly personalistic rule of the Muammar Gaddafi. The eccentric and ruthless dictator established little in the way of institutions that would survive him; he ruled largely through caprice and ever-changing fiats. As Libyans struggle to establish democracy, they face a long, tough slog to establish formal institutions of governance guided by the rule of law and rational administration. It is hardly surprising that Libya is somewhat chaotic 11 months after Gaddafi’s death. Not least, tens of thousands of armed fighters are still operating in irregular militias throughout Libya. Other transitioning democracies – including those with a more helpful past – also face long roads to establish social and political order rooted in law and freedom. The United States and other democracies must be patient with the Libyans, even as we seek to bring the Benghazi attackers to justice. Lasting democracy cannot be established in one or two years. Anyone who says otherwise is simply wrong. *** Did you like what you read here? You might be interested in the new book by this blog’s author, Failed States: Realities, Risks, and Responses. 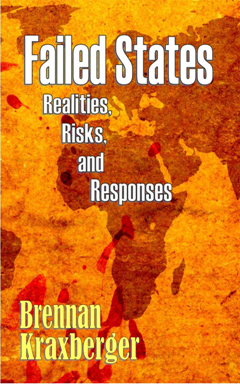 The book Failed States: Realities, Risks, and Responses is now available for purchase from Amazon (ebook: $4.99, U.S. dollars; print: $8.50, U.S. dollars).